Background: Epigenetics has proven to be a missing link to understand different diseases. However, the full understanding of chemical modifications of histones is still challenging. Initial research was focused on the ‘editing’ (writing/erasing) processes in the epigenome. More recently, the modulation of ‘reader’ enzymes has shown therapeutic potential. Bromodomains and Extra Terminal domain (BET) proteins have been related to chronic diseases such as diabetes and cancer. Different inhibitors of the BET family are known but, to date, none of them has reached approval for clinical use. Herein we discuss the insights of a structure-based analysis of the enzyme active site and searching of new BRD4 inhibitors. 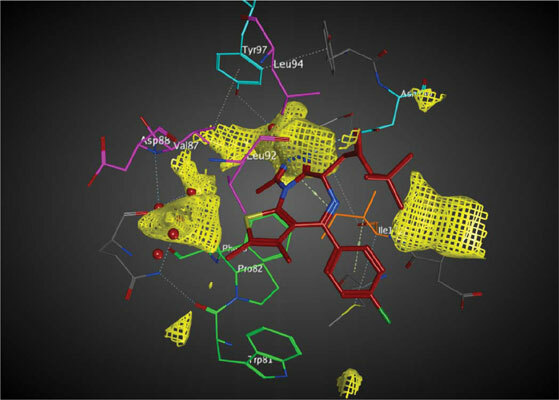 Methods: The search for novel inhibitors was based-on a multi-step approach using 2D and 3D similarity searching followed by molecular docking. Results: Among the most promising hits, one has a novel chemical scaffold. Other hit has a molecular scaffold with experimental report of activity. The later result supported the proof-of-concept of the computational approach. Receptor mapping provided additional insights into the pharmacophoric characterization of BET-inhibitors as well as on the haptophoric features required for optimal inhibition and ligand recognition. Conclusions: Finasteride and amentoflavone are promising candidates for BET inhibition. Amentoflavone has a molecular scaffold with experimental report of activity. Receptor mapping showed that the pocket size of BETs accounts for selectivity, which agreed with previous findings. Keywords: Docking, epigenetics, epi-informatics, molecular interactions, receptor mapping, similarity searching. Keywords:Docking, epigenetics, epi-informatics, molecular interactions, receptor mapping, similarity searching. Abstract:Background: Epigenetics has proven to be a missing link to understand different diseases. However, the full understanding of chemical modifications of histones is still challenging. Initial research was focused on the ‘editing’ (writing/erasing) processes in the epigenome. More recently, the modulation of ‘reader’ enzymes has shown therapeutic potential. Bromodomains and Extra Terminal domain (BET) proteins have been related to chronic diseases such as diabetes and cancer. Different inhibitors of the BET family are known but, to date, none of them has reached approval for clinical use. Herein we discuss the insights of a structure-based analysis of the enzyme active site and searching of new BRD4 inhibitors.